In Russia, we do not have the choice between dictatorship and freedom, but between dictatorship and chaos. The minds of nations can often be summarized in symbols. In America, we have the Statue of Liberty and the English nation has Big Ben. In Russia there is St. Basil’s cathedral towering over Red Square in the heart of Moscow, standing as a symbol of the imperial grandeur of the nation. The cathedral is an unusual structure without precedent. Most Christian churches have an orderly structure while St. Basil’s is a blend of seven oriental domes that give the structure the appearance of flames reaching upward towards the sky. The cathedral was built under the orders of Russia’s first Tsar to commemorate the victory over the Khanate of Kazan in the sixteenth century. As such, its stylings celebrate the incorporation of the Tatar people- the people of the Khanate of Kazan that had ruled them for centuries- into Russia and marks the beginning of an empire. But what is key as it relates to the current crisis in Ukraine is that at a deeper level it serves as a symbol highlighting the core desire of the Russia nation behind its drive to create and sustain the largest contiguous land empire in human history. “Terrible” is a really poor and unfortunate English translation for “Грозный” (Grozny). For Ivan IV, the grandson of Vasiliy III and popular owner of this moniker, the term Грозный may better be understood as “formidable” or “fearsome”. This controversial ruler spent most of his young life in paranoia hiding in the palace from the boyars (Russian nobles) who had poisoned his mother in order to exert their own power over the throne. However, during his coronation at age 16 he embraced a new official title that changed the course of his own fortune and the destiny of Russia. Claiming direct lineage from the rulers of the Kievan Rus, Ivan declared himself “Tsar” (a.k.a. – “Caesar”) of all of the Russian people. With this title, Ivan places the ruler of Moscow as categorically superior to the other nobles (his ancestors were simply “Grand Dukes”) and that the authority is derived from the Kievan Rus and extends to all Russian peoples. Ivan quickly consolidated his power through a reign of terror that began with his own Russian people. The new Tsar captured and killed his rivals without restraint- truly “Грозный”. Once his internal position was secured by eliminating the Russians who had threatened his safety as a child, it was time to subdue those outside of Russia that similarly threatened his security. Throughout Ivan’s youth the Tatar armies of the Kazan Khanate terrorized Russian territory creating a constant threat to the fledgling nation’s sovereignty. In 1551, Ivan IV set out to end this threat permanently by going on the offensive. Just like the boyars, the only way to ensure safety is to eliminate threats. 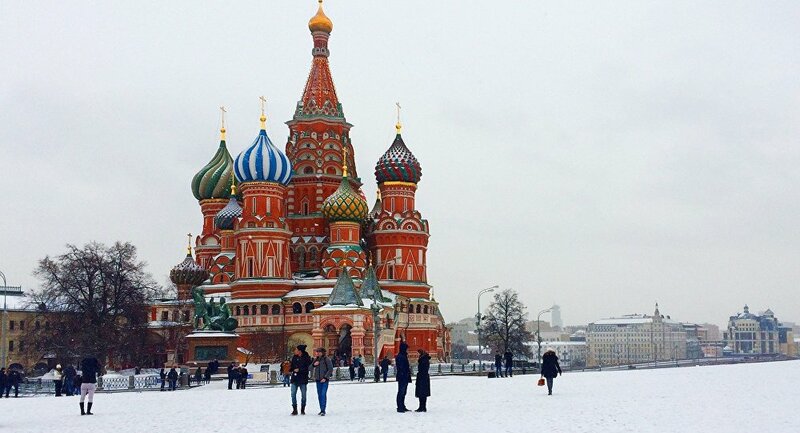 Kazan fell to the Tsar’s armies in 1552 and Ivan built St. Basil’s in Moscow to celebrate the victory. This marks the beginning of over three centuries of Russian expansion in every direction across the world’s largest continent. Some even say that the rate of Russian expansion and colonization during this time even surpassed that of the English Empire. At every step along the way, Russian rulers have extended their reach in order to guarantee the protection of the core- Moscow. The greatest test of this hypothesis came at Borodino in 1812 when Napoleon’s Grande Armée defeated the Tsar’s forces and occupied Moscow. The Russian army eventually triumphed through attrition and control of the country-side, but the lesson to those who ruled Russia was obvious. The Russian Empire had reached its natural limits in the East with the Pacific but controlling the borderlands of the West was crucial for its security. Since Borodino, Russia has sought to aggressively control its western frontier whether it is by partitioning Poland, alliances with Nazi Germany, or establishing satellite states through the Warsaw Pact of the 20th Century. I believe that this longer view of Russian history provides understanding and even a measure of empathy behind the current Russian actions against Ukraine. Ivan spent his life consolidating power and control. Control brings safety for self and those under your domain and the only way for Russia to be safe is to control everything and everyone at the edge of its domain. But what about those that live on the edge of their domain? What about their freedom?